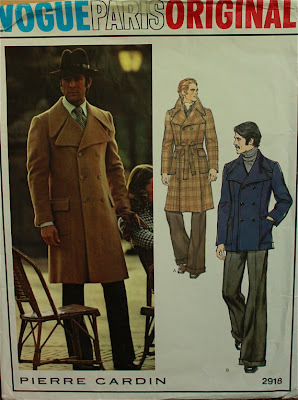 A rambling story on the subject of sewing for men, finding a decent pea coat pattern, and feeling guilty about not sewing for the guys in my life……. So this past weekend was a bittersweet one for me as my husband and I dropped off our son at his new home for the next few years, UC Berkeley. We got him settled in and took him out for a nice sushi dinner and stayed in a nearby hotel. The Hotel Durant is a great place to stay if you are ever in Berkeley. I spent the evening tossing and turning and worrying that my son had forgotten about a million things. A random guilt provoking thought popped into my head that night as I tossed and turned. I had never sewn for him in the past few years since I started sewing clothing……or for my poor husband who pretty much pays for this passion. Did I mention I’m Catholic? We feel guilty about things a lot. The next morning we had a farewell breakfast with Oliver and I steeled myself because I was taking my husband fabric shopping at Britex fabrics in San Francisco! I worried about him sighing heavily the whole time as I shopped for fabric….you probably know that feeling if you have ever taken someone fabric shopping who doesn’t sew. The boiled wool from Britex fabrics Richard picked out for his coat. A very rustic looking coat it will be! 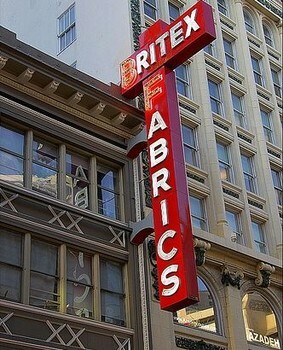 I had heard from lots of bloggers about how fabulous Britex Fabrics is and they weren’t wrong. 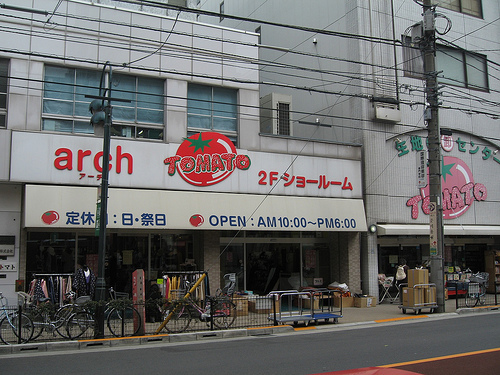 For someone used to shopping in the Los Angeles garment district like myself and haggling with foreign shopkeepers to buy fabric, this type of luxury retail fabric shopping was a new experience. There were clerks who actually wanted to help and knew where everything was and had knowledge about all of the fabrics, like where they came from. My husband was with me and it was the first time he showed any interest in the whole business. Looking through the woolens sale, he found a wool fabric he fell in love with and we decided right then and there that I would make him a FABULOUS PEA COAT. We walked out with three yards of boiled wool , some flannel backed coat lining and fifty dollars worth of beautiful English horn buttons to make him the pea coat he has always wanted….. But as soon as I got home I started Googling mens sewing patterns and you know what? THEY STINK! 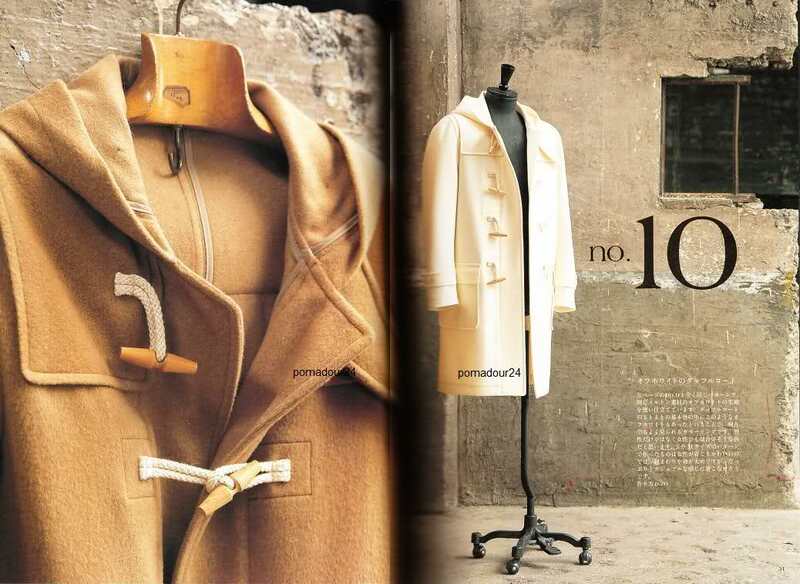 I could not find one single pea coat pattern and I looked through ALL of the modern pattern companies , the big ones AND the smaller indie ones. Nada Zilch. 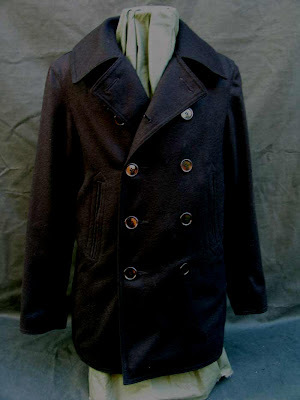 Not even the historical pattern companies had a pattern for the traditional naval style pea coat as pictured below. 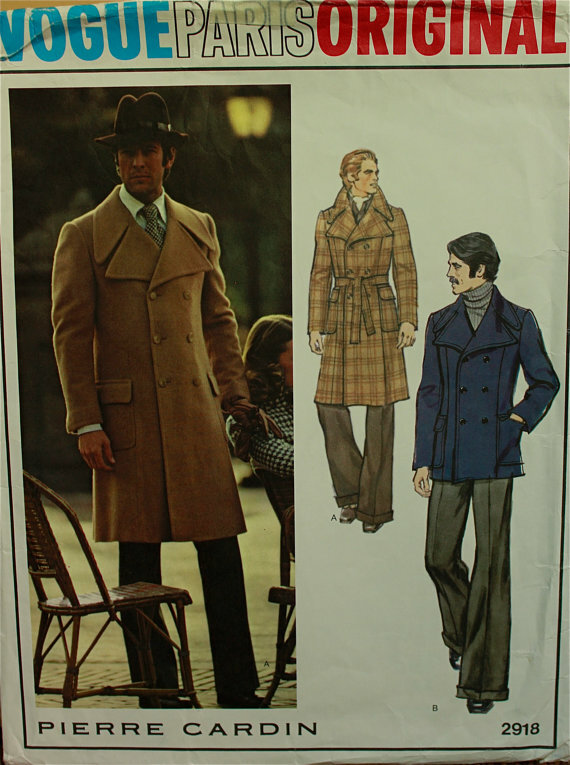 I did find a seventies pattern, however, but ithe huge lapels and fit and flared shape weren’t what Richard had in mind……. 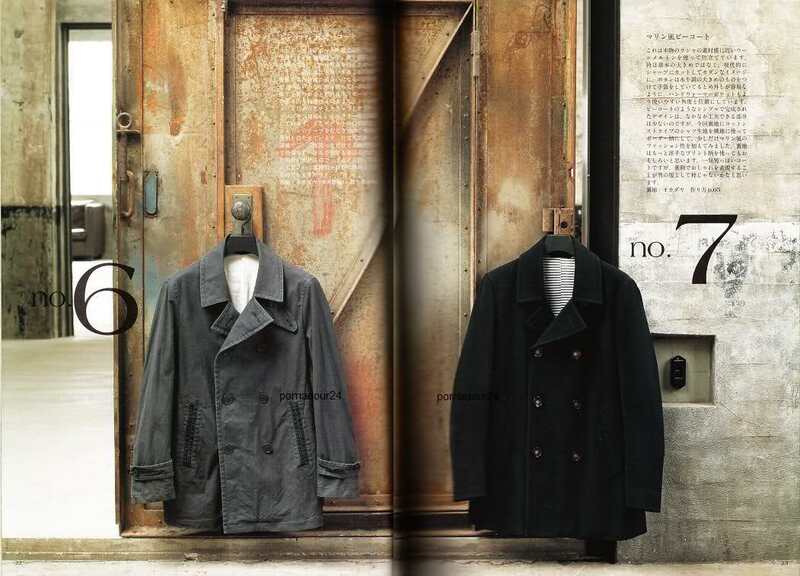 This is the type of peacoat style my husband wants. After searching for a couple of hours I ran across a blog written by a fellow who has been sewing his own classic and elegant clothes from a Japanese Pattern Book. His blog is called The Japanese Pattern Challenge. Pretty spiffy aren’t they? Nothing fancy. 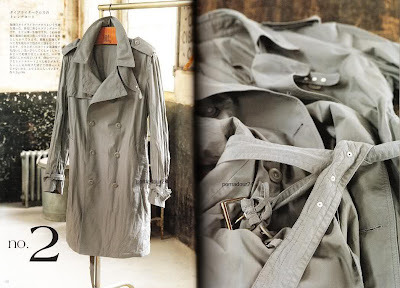 Just traditional stylish mens clothes. 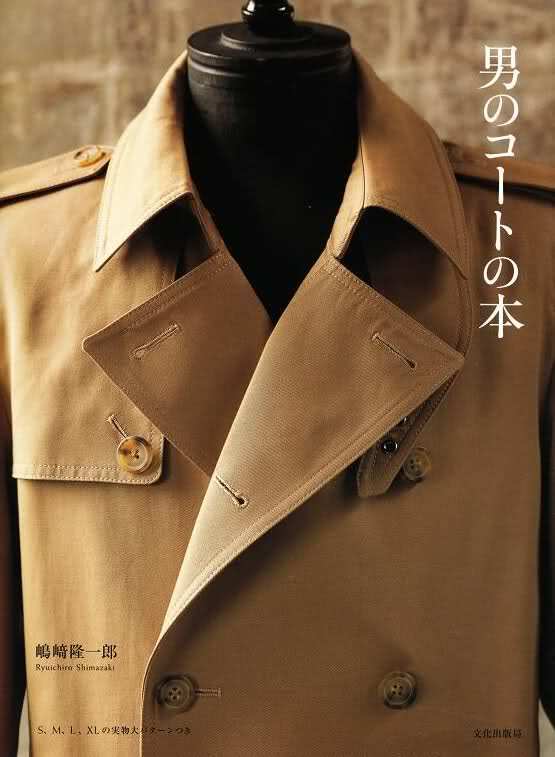 Thank you Japanese Pattern book! Now I only have to wade my way through the Japanese intructions! If you are interested in learning about some other blogs bymen who sew you can check out a few more I like. That’s a short list but I’d love to learn of a few more. If any of you know of any others let me know. I would never dare venture to sew for my husband since the disastrous time I tried to sew him a bathrobe when we were first married. I forgot to pre-shrink the fabric and I ended up with a short, short, toga instead of a bathrobe! Suni at A Fashionable Stitch sewed a lovely coat for her hubby this winter. It is very ‘hipster’ in its style, but I was quite impressed. You should check it out. I came across the same thing trying to make pea coats for my sons. No patterns, nowhere, nohow. I had to break down and buy them. :o/ I can’t believe that there are so few nice patterns for men out there. I have a husband and two grown sons and I would sew for them even more than I do if I could find the dang patterns to do it with. Great fabric, Justine! And you’re so brave with a Japanese pattern book. Such a fun adventure – watch how much your husband’s interest in sewing is going to grow now!!! And good job saying goodbye to Oliver for a little while – that couldn’t have been easy, but he will have such a wonderful college experience! I hope I don’t create a monster. I actually quite like that 70s one… go fig. Maybe because I was born in 1980 and didn’t have to live through it the first time. But, my husband would probably hate it. I like the 70’s one too but he said no way! Quite a project! I recently finished sewing a wool & canvas jacket for my boyfriend… I had to use an ugly Vogue men’s parka pattern and modify the details to achieve a more tailored look. It’s true the choices for menswear in general are dismal. Glad you found something that will work! The only other male sewing blogger I know is TaylorTailor. He doesn’t post that often but he has sewn impressive Oxford-style shirts and chino pants. Justine, you are a very brave girl!!!!!!!!!!! I attempted blue jeans for hubby when I had first learned to sew [a newly wed].. Lets just say, he strongly suggest ,that I just buy him RTW clothes..lol]. The fabric is beautiful.. I just know, that was such fun picking it out and visiting the fabric store..
You are just “super nice”.. Have fun and I look forward to seeing your new book when it arrives. Oh , Judy I actually didn’t write that book! Thaks for saying I’m nice. I haven’t hear that for awhile! thanks for sharing….i used to sew for my dad and brother when i was a teen…but haven’t sewn for men in years….i actually just got some amazing flannel to make my husband a shirt for valentine’s day….the flannel shirts for sale are so cheap and yucky…so i am super excited about this one…it will be a great surprise! I agree that menswear is very neglected when it comes to patterns. I sew a lot for my son, who is now 6, but I have not attempted to make anything for my husband yet because the styles I have seen are nothing he would wear. I did see a few Burda patterns I may try this year though. I am excited to see how your men’s pea coat will come out. Good luck and congratulation on your son, it’s just a wonderful school and environment !!! I’m looking forward to seeing how the coat comes together! I have yet to sew for my husband…he’s been asking when it’ll be his turn. Perhaps this year! That pattern book looks like a real winner! Excited to see how it goes. My husband hasn’t gotten any home sewn items either, put me in the guilty column! Guess i’m not the only one! My son actually said that he would like to learn how to sew and use the sewing machine – he’s 7 yrs old!! That project would intimidate me for sure! I haven’t built up the courage to make a coat for my daughter or myself yet much less the men in my life. Looking forward to seeing the finished product! Hi, Justine. I’ve been checking out the two blogs you mentioned, which are great, by the way, and I noticed that the guy from Male Pattern Boldness addresses your very question here: http://malepatternboldness.blogspot.com/2012/07/glory-days-of-mens-patterns-or-those.html#more Yes, I should be working on my pants pattern for the draft-along (you’re still doing it, right? ), but I’m looking through past posts on these two blogs instead. They are great. Also, I found this guy in Milano who you might like. I think he may sew, but I haven’t looked through all of his blog: http://gntstyle.wordpress.com/?p=420&preview=true His outfit in this post is really cool. What about this Peacoat pattern? I bought fairly recently (on sale, of course!) to make for my boyfriend, and I just love the classic lines! But anyway, that Japanese book sounds like a blast!